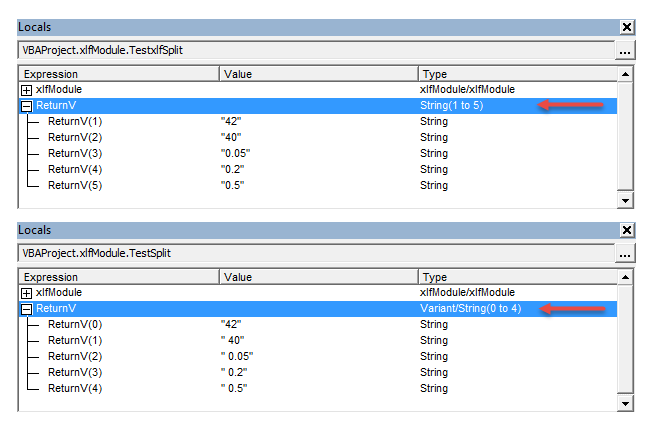 This module provides a variation of the VBA split function, using components of VBA code. It demonstrates a group of VBA functions, loops, and arrays. The procedure in code 1 is used for initial testing and development. Running the procedure with F5, the inclusion of a Stop statement (to suspend execution of the code), and Locals Window allows easy inspection of the array elements. InS = "42, 40, 0.05, 0.2, 0.5"
Code 1 is a two stage procedure - the position of each delimiter is determined, then the string is parsed / split based on the position values. Line 11: assign the test delimiter to the Delimiter variable. A comma ","
Line 15: ReDim the SpA array with 5 elements, indexed 1 to 5. In this section, the code 1 macro is converted to a function procedure (code 2). If IsMissing(Delimiter) Then Delimiter = " "
Line 1: declare a function procedure named xlfSplit with compulsory argument Instring of type String, and optional argument Delimiter of type Variant. • The default value of a type Variant is Missing. This value is then processed by the IsMissing function in line 11. The array of substrings in TestSplit is produced by the Dim ReturnV As Variant in code 3 line 10. If this was written as Dim ReturnV() As String, the same as code 3 line 2, then an array of strings would be returned instead.